Longtime San Antonio Spurs star Tim Duncan retired last week. The 40-year-old forward was one of the oldest players on the court; he had spent his entire 19-year NBA career on the Spurs. “It wasn’t any fun any more,” he said. You can be washed up as a basketball player at 30 or as a race car driver by 50 but the Stones and Chicago and show you can still be a rock star at 70. Robert Lamm who may be the youngest of the old rockers is the old man of Chicago; he was born in 1944. There’s a long list. Mick Jagger was born in 1943. Paul McCartney, Al Jardine and Brian Wilson (born 1942). Eric Burdon, Paul Simon and Artie Garfunkel (born 1941). Ringo (born 1940). Dion (born 1939). And Leonard Cohen, forced by finances to go back on tour in 2008, was born in 1934. Chuck Berry (born 1926) will perform his 207th show at Blueberry Hill in his native St. Louis on August 13. The full Social Security benefit age — the unofficial official retirement age in the U.S. — is 66 for people born in 1943-1954; it gradually rises to 67 for those born in 1960 or later. Huh. I turn 67 this week so I did the “fun” test, too. First I had to list what I actually do. Alphabetically, of course. I like to be on stage but I never wanted to be a rock star. My hands aren’t big enough to hold a basketball but I never wanted to play ball. I was a race car driver and would still do it if someone would pay me but it’s tough to win as we get older. Dangerous, too. Ove Andersson was a Swedish rally driver and the first head of Toyota’s F1 program who died at 70 in a vintage rally crash in South Africa. Bob Akin, journalist, television commentator, and champion sports car driver, was killed at 66 in a crash while testing a Nissan GTP for the Walter Mitty Challenge. J. D. McDuffie, 52, died in a crash at the Glen. Dale Earnhardt was almost 50 when he died in a crash at Daytona. Neil Bonnett died at 47 when he returned to racing after retiring. Still, Morgan Shepherd took the wheel of the Number 52 Toyota at age 71 and became the oldest driver ever to start a race in NASCAR’s Sprint Cup series and became the second-oldest NASCAR Cup winner (after Harry Gant) when he won in Atlanta at the age of 51. He had made his Cup debut in 1970 but, even with no chance to grab a competitive ride, he still has no plans of slowing down. OK, no slowing down, just changing direction. I’ve already spent entirely too much time doing Windows 10 upgrades this month and didn’t have any fun. Some of my IT clients have already retired and I have now passed all but one of the rest to a really great shop in St Albans. Cool. IT Department will close this year. I like goofing off. Keep. Ditto inventing stuff, photographing stuff, renovating stuff, traveling, and writing other stuff. I should do more of that and improve the workflow so I have time to do #2. I’m ready. If I never have to fix anything in an old house again, I’d have time to do #2 and #3. I like the arts and enjoy the people but I’m not in North Puffin enough any more to do it justice. Longtime local arts service organization chair is stepping down. The search starts now. Inquire within. “When I start hitting the wall or something, then maybe it’s time to get out,” Mr. Shepherd told Sports Illustrated in 2013. Morgan Shepherd gives us all hope innit. Maybe we could race a little again, too? “This Sunday’s 25th anniversary Summer Sounds Benefit Music Festival [was] a fun way to bring the community together during Childhood Cancer awareness month and to support Camp Ta-Kum-Ta’s year-round programs” said the camp’s Executive Director, Hattie Johnson. The Benefit Music Festival took over the Franklin County Field Days grounds yesterday with continuous music on two stages. The proceeds will benefit Camp Ta-Kum-Ta and help the Town of Highgate build a band stand. You can’t put on a major concert series for 200 bucks, so I conned, er, invited most of the local businesses to kick in and it started a plan and a series. The plan was for the municipalities to underwrite the series and for local businesses to sponsor each concert. We encourage local nonprofits to “host” each concert with a social to show the flag and earn a few bucks for their own causes. Over the years, more than half of the Franklin County towns have welcomed Summer Sounds. 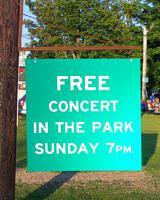 The concerts are always on Sunday night, always in a Town Park, always at 7 o’clock, and always free. Yesterday we capped a quarter century of Sundays with just the best benefit concert: continuous music on two stages from 2 p.m. right through about 9; admission was by donation. This has been a transition year for Summer Sounds. We’ve had stars from the first years of the series as well as some younger performers who will grow the concerts for the next 25 so we booked the same yesterday. All the bands and everyone else working volunteered their time. Volunteering is the key. The bands jumped aboard right away. Our hosts had more than 30 “helpers” flipping burgers and serving up popcorn and snacks and coffee and desserts, with even more behind the scenes baking and helping. Half a dozen MVU High School seniors and a couple more BFA seniors helped SWMBO and our son, Karl, dip ice cream, serve sodas, and sell tickets. My friends at TimKath Productions did the sound magnificently and kept us on track despite the monkey wrenches I kept dropping in the schedule. The Highgate Highway Department turned out in force today to put the Field Days site back in order. We all had one disappointment. We had room for thousands in the audience. We wanted hundreds in the audience. We didn’t get either. My own daughter dropped in Saturday evening. “What ya doing tomorrow,” she asked. “Going to the concert,” I said. We were all over our email list, the posters, the newspapers, the event calendars, the television, the radio, the Facebook. It was the Patriots v. Bills that everybody stayed in for (the Pats won). That’s my story and I’m sticking to it. I just wish I had a magic wand that let me add my event to everyone’s calendar. Especially yours. Bunch of people I need to introduce. Starting in 1994, Jenni Johnson has played more Summer Sounds concerts than anyone else. She is the Billie Holiday of Vermont, except she was once a Supervisor of Physics and Counselor at MIT. Singing jazz, blues and funk has been the center of her life since she was a teen in New York City. Best jazz singer I know bar none and wonderful with kids. incaHOOTs has exploded in popularity across Northwestern Vermont this year. The Plattsburgh-based band first played Summer Sounds in 2003 and have brought their country-rock-jazz-pop music to venues from Highgate twice this year to Nashville last weekend. Jon Gailmor is about the most eclectic, emotional, exhilarating, optimistic, and provocative rock star I know and he’s done it in front of the flagpole in Highgate Municipal park and fronting the Vermont Symphony in the Flynn. His low in cholesterol original music, ballads, and ditties will make up for the ice cream and cake. He first played for me in 1997. OK, he’s actually a solo performer who is kind of folkie, kind of rocky, and sometimes a little dirty. Jennifer McConnell is gifted and inspirational singer and a music teacher in Franklin/Sheldon. She will be one of the two new leaders for the St Albans Community Band. The Sky Blue Boys are “just” a couple of fellows with a mandolin and guitar, but what a couple of fellows. Banjo Dan and Willy Lindner are actual brothers for this “brothers duet” that was the predominant format in this country in country music of the 1930s and 40s. They first appeared in Summer Sounds in 1994. We introduced Summer Sounds, Gen II, (we called them the Summer Sounds Singers, musicians still in high school just getting their performance chops). There are a lot of these kids singing at open mics, in talent shows and school musicals, and in some cases in Fenway Park. Drew Briggs went to school for French and linguistics and learning languages is his passion. He’s a standup comedian who really enjoys running improv games (think Who’s Line Is it Anyway?). Savannah Burns is 15, lives in Swanton, and attends MVU. She has been in two musicals, Annie and Shrek the Musical. She had a leading role as Cinderella in the one act play, Into The Woods, at Johnson State College. Soukaina Jamil is 13-year old seventh grader from St. Albans Town has been singing since she was in the third grade. She also plays the trombone and is teaching herself how to play the ukulele. Mingo Maquera is 17 and a senior at BFA-St. Albans where he is the male lead in the production of Footloose November 12-14th. He’s also an extremely accomplished vocalist and plays keyboard, all manner of guitar and the drums. As Andre and Wendy Maquera’s son, he has music in his blood. Rosie Newton is 14 and a freshman at BFA-St Albans. She’s frequently on stage in both school and local theater productions and is a member of the Contois School of Music band. Oh, yeah. And she sang the Star Spangled Banner at Fenway last year and for the Lake Monsters this year. Jaylin Seaman is 14 and a freshman at BFA-Fairfax. She plays Princess Fiona in Shrek the Musical at BFA-Fairfax November 12, 13, and is a member of the Vermont Musical Theater Academy at Spotlight on Dance. Wednesday morning on the phone with Russell Crowe. Really. Green Mountain Coffee had promised us a donation but a technical glitch kept us from completing the order. Russell was the calm island in a sea of chaos, something you might not expect from the silver screen. “I wouldn’t mind getting just one of his paychecks,” he said. He also moved heaven and earth and the coffee arrived on time. It was c-o-l-d yesterday and people were glad to have it. Sunday morning, early early, the geese in our little cove talking about how cold it was and planning to leave right away for Pennsylvania. Jenni singing Happy Birthday to Soukaina Jamil who had just turned 13. We surprised and wowed Soukaina. Chuck (the Junketeer’s pianist) accompanying Savannah. Rosie singing Hallelujah. In the last decade or so, Leonard Cohen has finally grown into this song and is old enough to sing it. Rosie hit it out of the park. Her voice is right for the song and she brought the gravitas it deserves. That just blew me away. Jon and I realizing we had spent some of our early childhood (where we never grew up) in Quaker country, 20 or 25 miles apart in Pennsylvania (he likes to say he was born in New York State and failed to grow up in Philadelphia, up by Overbrook when my grandfather was there for Temple). He’s a Penn grad. I sure do wish more people had been there. I never got to the 1969 Music & Art Fair everybody still talks about. I was in school in beautiful, downtown Hoboken and we were all too serious to drive a couple of hours north to stand around in a muddy field in the rain for a long weekend to listen to rock-n-roll music. Heck, we could get that for free (or for the price of a couple of beers) right across the river. I got a sort of second chance. The Trout River pummeled Montgomery, a small town halfway up the mountain on the eastern border of my County. Our friends and neighbors there lost houses, clothing, furniture, food, cars … The lasting image I have is the same as Marathon, Florida, after Hurricane Wilma or New Orleans after Katrina. Fortunately, no lives were lost. Local water supplies were destroyed, flooded septic systems polluted lawns and wells, and the residents had to dig themselves out by hand. Floodstock took about 23 days to organize, probably a record for a concert with two stages, a world class headliner in April Wine, and 17 other exceptional entertainers. We applied for and received an Act 250 permit, AOT permissions, and created a plan to shut down the airport in the event of problems. There were no problems. And it didn’t rain even a single drop. Franklin County Field Days donated the site that had housed the Grateful Dead two years before. We had a great fence but had to build new stages. Floodstock was a family event, so a kids’ store set up a corral with toys, activities, and volunteers to keep the kids happy. We also had a splendid hospitality area for the handicapped and for folks who needed a place to sit down and relax in the shade, thanks to the Town Manager and his merry band. More people have asked how we got nearly 700 custom tee shirts so quickly; here’s that story. Natalie LaRocque-Bouchard designed the Floodstock logo and e-mailed it to me for the website, for posters, and for other publicity. A Northfield shop owner offered as many shirts as we wanted for the cause. The shirts were stored in bins in his converted mill building in Northfield; all we had to do was come down, count them, and truck them home. Two peeps volunteered. They drove to Montpelier Thursday afternoon to deliver the AOT contract and to pick up the shirts. They didn’t know about counting them, so they retaliated by picking an extra extra EXTRA large florescent orange shirt for me. Unfortunate, a traffic incident delayed them as they approached home with the load. Our printer finally received the shirts late Thursday evening and printed them Friday morning. We gave away shirts to almost 400 volunteers, community groups and band members, and sold the rest on Sunday. Frank Barnes of 8084 and I co-chaired the effort. Most of the back stage folks signed the orange shirt while I wore it all day Sunday. The biggest concert I’ve ever presented left my brain toast, my feet mush, and I couldn’t stop smiling. In 78 hours the Field Days/Grateful Dead site went from a bare field to a dual-stage major concert site, to a bare field again. All with volunteer help. Everyone who helped out took home a host of wonderful images; in no particular order, here are some of mine. The National Guard lashed 4 flatbed trailers together for the main stage, leveled them with blocks and jacks, then built an extension out of Field Days’ bleachers. The Friday afternoon phone call from Grover: “We can power the sound or the lights, not both.” While we searched frantically for a 120 KVA generator (rarely available at the local home center) and tried redesigning the sound, the Swanton Village Electric team quietly found us enough juice. A pediatrician lopped the ends of the staging with his chain saw. We ran short of volunteers around 5 p.m., so a whole gang simply stayed over and worked a double shift. April Wine’s Myles Goodwyn hit the first chord and the lights in the production trailer browned out. The lights danced with the beat for the rest of the show. Tech guys slept in hammocks strung under the trailer-stage through some of the loudest sets. Jesse Potts bragged to me that he had never sounded so good. Jesse, I was in the crowd. The tech guys for each stage had a little friendly competition going and everybody sounded great! Rebuilding the Field Days fence Monday afternoon with Highgate Town officials and friends. The April Wine setup on stage included a canvas enclosure to hide the drum set until their show started. I was backstage for the 8084 set, watching April Wine drummer Jerry Mercer in his private tent play beat-for-beat with 8084 drummer Scott Belisle. Cell phones were not widespread in Vermont in 1997. There may have been a cell tower. Somewhere. We needed a phone line but NYNEX/Bell Atlantic was dragging its collective feet about installing a temporary phone line to the Field Days site (the wire was already there — all they had to do was flip a switch back in the office). At 4:59 p.m. Friday, I was in the Town Clerk’s office, on the phone pleading with the NYNEX supervisor who had his hand on the switch. At 5 p.m. Friday, NYNEX turns off its phone lines. Bang. Static. Dead air. I sat down. I hung up the phone gently. And I had an epiphany. 100 years from now no one would remember we couldn’t make any calls. All the bands played for free. Vermont received about $7.5 million in Federal aid. That takes care of roads and bridges. It didn’t help the individual homeowners and renters who lost everything. All Floodstock ticket revenues went to the Montgomery Flood Fund. Most of the kids in Newtown, Connecticut, were born in 2006 not long after the 21st Century began. Many of them would have seen the turn of the 22nd Century. From the Daily Beast to the Violence Policy Center, special interest groups, editorialists, and politicians lined the Sunday talk shows to politicize the murders in order to … well, you already know, don’t you? Mr. Obama came under increased pressure this weekend from Democrats to lead the charge to ban guns. CBS’ Bob Schieffer wonders if this is the tipping point so we finally try to ban guns. Rep. John B. Larson (D-CT) released a statement Saturday that “to do nothing in the face of continuous assaults on our children is to be complicit in those assaults” in his effort to ban guns. Sen. Dianne Feinstein (D-CA) promised immediate action on gun control. Sen. Charles Schumer (D-NY), the author of the Brady Bill who just three days ago worried that the fiscal cliff will hike milk prices to $6 per gallon, has joined with Michael Bloomberg to make 16 ounce drink cups illegal. And to shrink the size of handgun clips. The killer who triggered the second-deadliest school shooting in U.S. history got off lucky. His quick suicide was far less than he deserved. No, I will not publish his name. (2) What about the other people killed this year? Don’t they count, too? Mother Jones reported that, “Since 1982, there have been at least 62 mass murders carried out with firearms across the country, with the killings unfolding in 30 states from Massachusetts to Hawaii.” 43 people were slain in other mass murders in 2012 alone. And the year isn’t over yet. Since 1982, there have also been at least 90 commercial airline crashes that killed people in this country alone. I didn’t total how many thousands died. Heck, 445 people have died so far this year in commercial aircraft accidents around the world. That includes the Allied Air flight on June 2 that overran the runway and hit a bus. All four in the crew survived but 12 people on the bus died. And the Ozark Air Lines flight that struck a snow plow at Sioux Falls Regional Airport. The driver of the snow plow was the only casualty there. Dammit, we need to ban commercial air travel is what! There were 32,367 motor vehicle deaths last year. Cars kill more people than bathroom accidents (341 people drowned in baths and showers in 2000). Don’t you think we need to ban cars? And probably bathrooms? The War on Terror has taken 4,977 American lives since 2001 in Afghanistan and Iraq alone. How about a ban on terror? On average, more than three women are murdered by their husbands or boyfriends in this country every day. In fact, 1,247 women and 440 men were killed by an intimate partner in 2000. 50% of the men who frequently assaulted their wives also frequently abused their children. We probably need to ban intimate partnerships. The mad bomber of the Bath School “disaster” in 1927 killed 38 elementary school kids, most in the second to sixth grades, plus two teachers, four other adults, and the bomber himself. It remains the deadliest mass murder in a school in U.S. history. And a truck bomb made of fertilizer and diesel fuel killed 168 people and injured over 800 in the Murrah Building in Oklahoma City. No, I will not publish those murderers’ names, either. Maybe we stick a plug up the back end of cows to eliminate fertilizer. Newtown was one nut with a gun. The number of crimes involving handguns in the UK has more than doubled since the ban on the weapons that passed after the Dunblane massacre, from 2,636 in 1997-1998 to 5,871 last year. The United bloody Kingdom. It is already illegal to shoot people, even if you didn’t mean to. Connecticut and New York have about the toughest gun laws in the nation. This is the second mass killing in Connecticut in two years. We don’t need more laws. We need more answers. In fact, as the earth gets hotter, I’m surprised no one has noticed the direct correlation between mass murder and Global Warming. Or between mass murder and nutcases who dream about killing people. If two guys ride one wheel each, are they really riding a bicycle-built-for-two? “No,” Liz Arden said. Emphatically. Sunday drivers — four wheels: We headed West along the Overseas Highway until I saw an interesting house in the distance on Middle Torch. Drove past it; it was interesting but not particularly photogenic. Jogged left and right and left and right and tested the shocks up and down over the frost heaves on Dom Road on Big Torch Key. Saw a plot of land reserved for theme camps out past the end of the power lines and took a bunch of pictures of dead mangroves. I didn’t photograph the thank-you-ma’ams. We honked and waved as we passed a couple of guys from Brooklyn riding unicycles near the South Pine Channel Bridge but, since we didn’t go looking for Key Deer this time, we didn’t see them on the No Name bridge to No Name Key. I hope they had pizza for lunch. Fat Albert played peek-a-boo with the clouds. I photographed a homeless fellow living large on Higgs beach as well as a couple of weddings on Smathers beach. Sunday drivers — two wheels: Keith Nelson and Robert Hickman arrived in Key Weird by unicycle yesterday. Their six-day performance art project commemorated the 100 years of the Flagler railroad bridges and the brand-new Heritage Trail system. 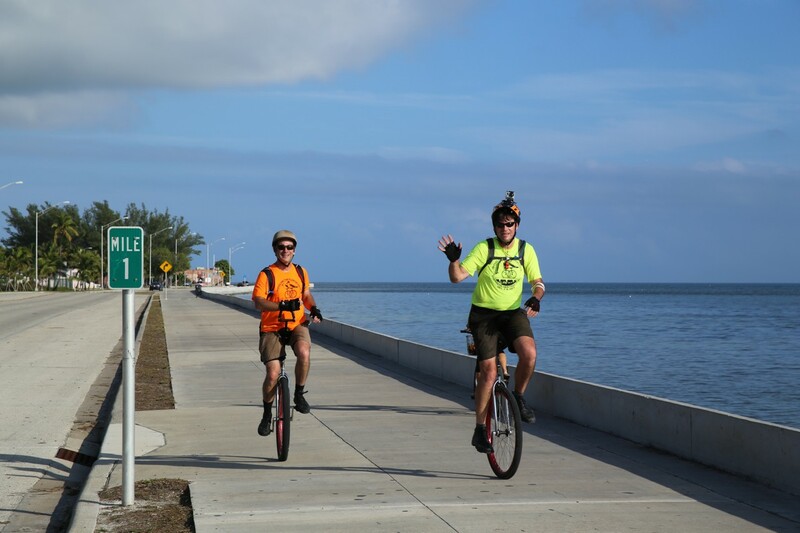 Mr. Nelson and Mr. Hickman pedaled along U.S. 1 from Key Largo to Key West on one wheel during their Unibridge Tour. They said the road quality was the worst in the 6-7 miles leading in to Key West but the Seven Mile Bridge quickly became the scariest part of the trip. It rained, their unicycles are taller than the railing, and traffic passed at 55 or 60 mph. Thwap thwap THWAP! Mr. Nelson swallows swords and juggles as the Clown Price of the Bindlestiff Family Circus. Safer than the Seven Mile Bridge. Mr. Hickman is an associate professor of sculpture and art at Hunter College, New York. They completed the trip as part of Sculpture Key West’s 17th annual exhibition. The show runs through March 2013 at Fort Zachary Taylor Historic State Park and West Martello Tower. Mr. Hickman wanted to exhibit a rock sculpted by the highway. He started the ride pulling the rock behind his unicycle but it built up friction in his tire. The heat exploded the tire so they cut it loose about Mile Marker 30 and kept on going. Everyone sets up at the southernmost point or at Mile Marker 0. Not me. I ran the motor drive about four rolls worth at Mile Marker 1 for the two unicyclists. 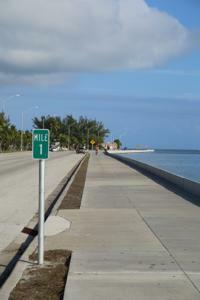 This bridge across Spanish Harbor from Bahia Honda is one of my favorites in the Keys. It’s worth a trip here before the remaining railroad bridges fade into the green waters.